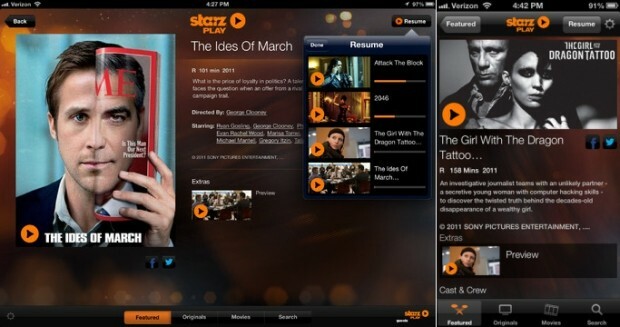 Earlier this year Starz pulled its online content library back from Netflix and now it's relaunching the old Starz Play branded websites and apps (iOS and WiFi only for now, 3G and Android coming soon) for authenticated streaming, similar to HBO Go and Showtime Anytime. There's also an Encore Play site, and it plans to launch one for its Movieplex channel in the future. Currently, the services only support logins from Cox cable subscribers, but if you're not on that pay-TV provider you may not be missing out after all. Starz has already licensed its content to providers like Comcast for streaming through its Xfinity website and apps, deals which it tells The Hollywood Reporter cover about 70 percent of its customers. Like HBO and Showtime, this probably is not a prelude to offering its service beyond the tethers of cable and satellite, but as exec John Huguez puts it, "it is an expression of (Starz') brand and user interface." That likely only applies domestically however, as Starz also announced it's licensing its content to the cable-free HBO Nordic service, and one can see how building up its technology means it could serve up its own streams internationally some day. Even if you get Starz, if your provider is large enough to handle its own business when it comes to online services this probably won't affect you. However, for customers on smaller cable companies or in the future when deals get renegotiated, you may have another app to add to your drawer for TV Everywhere-style viewing. New Starz Play website and apps stream only to Cox customers, but you might not need them originally appeared on Engadget on Tue, 09 Oct 2012 10:43:00 EDT. Please see our terms for use of feeds.